The Chimera, in mythology, is a Greek monster with the body and head of a lion with a snake for a tail and a fire-breathing goat head coming from its back. Different versions of Chimera mythology have slightly different descriptions, such as wings on the back or the back legs of a snake, but most follow the description above. No matter how you describe it, the Chimera is the daughter of Greek monster gods Typhon and Echidna, which means its siblings include other famous Greek monsters such as The Sphinx, Cerberus, and Ladon. Merely seeing the Chimera was a bad omen. 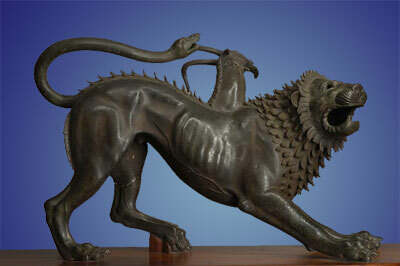 The Greek monster regularly appeared before disasters such as shipwrecks, violent storms, and volcanic eruptions. The most famous moment involving the Chimera in Greek mythology is when the Greek hero Bellerophon, with the help of his trusty winged steed, Pegasus, killed the Chimera with a bow and arrow from the sky above. Beyond mythology, the term "chimera" is used in scientific research to explain an animal that contains more than one set of genetic codings. This is a clear nod to the Greek monster, in that the monster itself is a combination of three different 'normal' animals. The use of the word "chimera" as a way of describing a hybrid "monster" of sorts seems to be the most lasting element of the Chimera mythology. In later medieval usage, the word was used to describe any hybrid monster combination, and had a deep connection to the evil and demonic. There are many hybrid monsters, even if you just look at Greek monsters alone, so it's somewhat interesting that the Chimera was the one of all of them to end up defining a term that is still used in multiple purposes today. Return from Chimera Mythology to the List of Mythical Creatures.